When I was about 12 or 13 (which would have been around 1985), my brother, who was active Army, sent me a bracelet for my birthday. At the time, I didn’t quite understand the significance of it, but I wore it every day. As I got older, I started doing research and found that Charles H. Meldahl went missing on October 20, 1968, and was considered MIA. Every day I wore the bracelet with his name on it. I wore the bracelet until it was no longer shiny red. I wore it until probably 2000, and then one day, couldn’t find it anymore. Until today. As I was unpacking boxes that have been boxed up for a decade or more, cleaning out my garage in hopes to regain my sanity AND to start preparing to move, it was tucked away with some fire service mementos. So, I came into the office to find out the status of SSG Meldahl. Cue tears. His remains were recovered February 14, 1995 and identified March 18, 2001. I only wish I’d known that his remains had been returned on 6/6/2001 because just a few weeks later, I was actually in Washington D.C. and could have left his bracelet at the Wall. There’s very little left to say, except welcome home soldier – thank you for your service. You and your fellow soldiers will never be forgotten. May you, and your comrades, rest in peace. 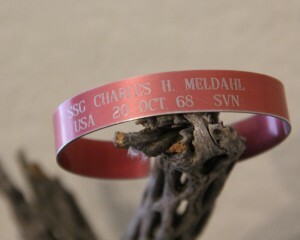 I’ve included the details about SSG Meldhal below. His entire team has since been found and their remains identified and returned. Other Personnel In Incident: Charles E. Deitsch; Henry C. Knight; Jerry G.
hours, it was determined that the helicopter was overdue. Memory Gardens. Home at last. of the crew was also identified through DNA.